As more & more successful companies press into the data-driven digital growth phase, metrics which measure how visitors interact with a website and how many visitors interact with a website are gaining importance as a KPI or measurement of a brand websites success. Tools like Google Analytics, can help measure these attributes. In this blog, we focus on two prominent metrics associated with web analytics – average time-on-page and average session-duration. We will talk about what they mean, how they are measured and the kind of information they can provide about a website’s performance. To begin with, let’s start by defining the terms “time-on-page” and “session-duration”. The time-on-page for a web page is calculated by the time difference between the point when a person lands on the page and when they move on to the next one. Clicking a link to go to another page in the website is the trigger that causes the time spent on the earlier page to be calculated. If the person exits the website without going to any other page, then the time-on-page is zero. A session-duration is defined as the time frame during which there are regular active interactions occurring from a user on a website. The session is timed out when there is no activity from the user for a pre-defined time duration (30 minutes by default). Session-duration takes into account the entire time that a person spends on a website. It is effectively the sum of the time-on-page for the different pages that a person visits on a website during a single session. Again, the time-on-page for the last page, from where the visitor exits, will be zero. 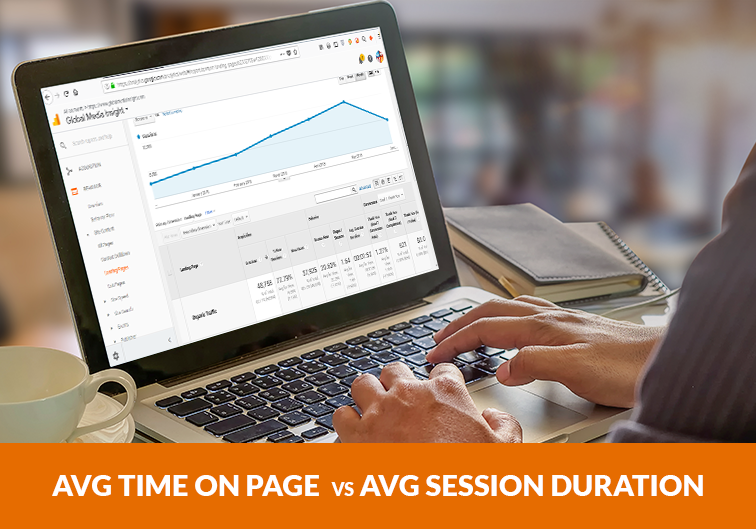 Wondering why the average session-duration is much less than the average time-on-page? While the time-on-page can never be greater than the session-duration for a single session, we can often observe the opposite when considering the averages for multiple sessions. This is because we exclude the number of exits when calculating the average time-on-page, whereas all visits are taken into account for calculating the average session-duration. To better understand these terms, we take three different cases on how a visitor can interact with a website. The time-on-page and session duration will both be “0” secs since they did not go to any other page. The time-on-page for Page A is 30 secs, and 0 secs for Page B. The total session duration is 30 + 0 = 30 secs. The time-on-page for Page A is 30 secs, for Page B is 20 secs and for Page C is 10 secs. Since the user clicked on an external link on page C after spending 10 seconds there, it will be recognized as a hit rather than an exit. Clicks are viewed as interactive events. Since the last known interaction with the page is after 10 secs, the time-on-page for Page C will be 10 secs. The total session duration therefore is 1 minute (30 secs (Page A) + 20 secs (Page B) + 10 secs (Page C)). You’ll notice that two of the three cases we explored above don’t offer us an accurate picture of the time that out visitor spent on the website. This is true for both the time-on-page and the session-duration. A person could spend a whole of 5 minutes on a page and it would count for nothing if they were to exit directly from there. Google Analytics allows us to monitor the actions that a user takes on a page, like clicking a menu button, opening an accordion etc. These can also be used to understand how the visitor is interacting with the page and is a much more reliable measurement than time-on-page. This is shown in Case 3 above. Google Analytics offers us the provision to create custom events. Custom events can be used to set a trigger at a specific time point. If you have set your trigger for say, 1.30 mins, and the visitor was to stay on the page for 1.30 mins or more, it could be counted as a pageview. This is better known as a virtual pageview. Any time below 1.30 mins would be counted as zero, and any time above it would be counted only if you were to click a link on the page. This can be especially useful when you have specific conversion goals. We hope that we’ve helped you gain a better perspective of these terms and how they can be leveraged to better understand your website’s performance. It’s important to note that even with their limitations, average time-on-page and average session-duration are not completely unreliable metrics.. In fact, they can be fairly accurate if the exit rate is low. Further, when used as part of the whole spectrum of metrics available on Google Analytics, they can provide valuable insights towards improving a website’s performance.